Huawei has grown from being a peripheral player to one of the biggest brands in smartphones in a short space of time. It started making a name for itself with competitive devices for good prices. These handsets often copycatted features from other flagships, but things have changed in recent history. Huawei's no longer an alternative to the bigger companies, it's become one of those companies. It's now the one bringing new features to market and pushing the boundaries with phones like the P20 Pro. That thing only came out six months ago, and Huawei's already back with the Mate 20 Pro, which feels like a successor despite the different family name. It's another nuts piece of hardware from the Chinese company, and arguably the best phone of 2018. 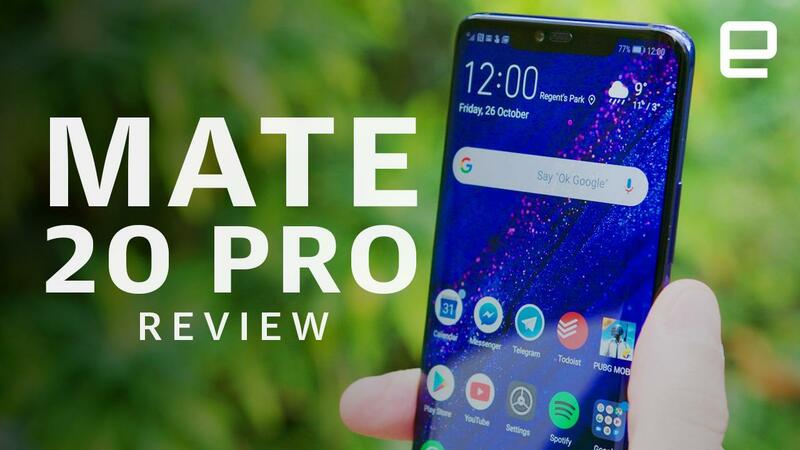 Be the first to review the Mate 20 Pro? Let's get the dream-dashing out of the way because the Mate 20 Pro won't officially be launching in the US. You can undoubtedly find it online alongside the more affordable Mate 20 and supersized Mate 20 X, but if you're treading that path, make sure to check network compatibility carefully and be prepared to pay over the odds for an import. Huawei's had a frosty relationship with the US for a while now: Carrier partnerships are non-existent, fueled by the government's suspicious attitude towards the Chinese manufacturer. Long-story-short, the Mate 20 Pro is not headed where it's not welcome. Take a blind feel of the Mate 20 Pro and you might as well be handling a Galaxy S9 or Note 9. Originality isn't really necessary here, though. Samsung's preferred contouring -- curved sides on both the front and back with a super-skinny frame separating them -- is just plain comfortable. Much more so than boxier handsets like the Pixel 3 XL. Because the vast majority of the Mate 20 Pro curves one way or another, there are no straight edges putting pressure on your palm or fingers and reminding you it's actually a pretty big phone. The slim body and lack of bezels also keep the device manageable despite the large screen. Thanks to the display's 19.5:9 aspect ratio, the phone's tall but not broad enough to feel cumbersome. It's still much easier to use with two hands than one, though. Apart from the Samsung similarities and lack of headphone jack, everything else about the Mate 20 Pro's design is pretty unique. The way Huawei's arranged the three cameras and flash into a single block, for example, make it look something like a crude robot eye. It's completely different from the more standard layout of the P20 Pro, and is no doubt divisive. I personally like its distinctive appearance, but I'm not a fan of how it protrudes off the back -- mainly because I'm worried about it picking up scratches -- and its edges also seem to harbor dust. Pretty much every phone has a camera hump, though, and Huawei includes a transparent rubbery sheath that puts a little bit of distance between coffee table and camera glass. Something everyone can agree on is Huawei's Twilight color scheme is gorgeous. Compared with the P20 Pro, the Mate 20 Pro has a darker and slightly less-metallic blend of black, purple and blue. The bright red power button is the cherry on top, and anyone grabbing the phone in one of the other colors like green or black is simply doing it wrong. On the blue and green models, the back glass of the device has what Huawei calls a "hyper-optical pattern," which is a visible texturing that's supposed to repel fingerprints and give it a non-slip effect. However, even the Twilight model feels a tad stickier and clings to the arched arm of a sofa a bit better than other glass devices. Update 11/2/2018: The above paragraph has been updated to reflect that the "hyper-optical pattern" is only present on some models. The front of the Mate 20 Pro is basically all screen. There's a little bit of bezel on the bottom edge and a broad notch up top, but that's it. The notch on the device is a bit wider than the one on the P20 Pro because Huawei's added a 3D depth sensor for more secure face-unlocking. This feature works nigh instantly 90 percent of the time, day or night, at weird angles and when half of your face is smushed into a pillow. On the rare occasion it fails or you're poking at the phone on a table rather than holding it near your face, there's the in-screen fingerprint reader. This is much faster than I was expecting -- milliseconds slower than traditional fingerprint readers at the most -- because I haven't tried one before. It's still a rare feature and one that's notably absent on the latest Galaxies, Pixels and so on. It's very well built, evidenced by its IP68 waterproofing rating, but there is one, slightly confusing quality issue. The glass on the front isn't very robust. I'm very careful with my phones. I never lose them and because I don't like the added bulk of cases, I try not to put them in pockets with keys and similar objects. And yet I've spent only a week and change with the Mate 20 Pro and there's some noticeable scuffing of the front glass. I suspect it's the outer, anti-fingerprint layer that's been damaged by a loose coin in a bag pocket or something, rather than the glass itself. It's not a great look, though. Replacing the curved glass is definitely not going to come cheap and buying a screen protector feels like something you shouldn't have to do with a phone that sells for over $1000. The Mate 20 Pro's display specs kinda speak for themselves: a 6.39-inch OLED HDR panel running an above 2K resolution. It's big, it's detailed, colors pop and blacks are deep (as you'd expect from an OLED screen). It cuts through the majority of glare you'll run into on a sunny day, and, in general, it's just a great screen for watching YouTube, playing games and reviewing your camera snaps on. Compared with the OLED screens of the Note 9 and Pixel 3 XL, the Mate 20 Pro's seems to be a bit more luminous, regardless of where you anchor that brightness slider. Contrast isn't as moody on the Mate, though, and colors aren't as warm. Skin tones are a good indication of this -- they appear more natural on the Note 9 and Pixel 3 XL, with no differences I can see separating these two. Ultimately, you might prefer a warmer screen, but there isn't a huge gulf between any of the handsets. Only under purposeful scrutiny would you spot these slight distinctions. In terms of audio, output from the Mate 20 Pro's stereo speakers is predictably tinny and lacking in bass. I wouldn't have invested much in the loudspeaker quality if I was Huawei either, though. There's little space around the thin border for decent-sized grilles and the rest is glass, so the fact it's good enough for hands-free calls is fine by me. I find the lack of earphone volume to be a genuine problem. Using the USB-C earphones included in the box -- even cranked up to maximum -- I can barely hear my music above the rattle of a London subway car. All the other USB-C headphones I've tried, including regular 3.5mm cans hooked up through the bundled adapter, are much louder. In a pinch, however, you can disable the Dolby Atmos equalizer in sound settings and squeeze a bit more volume out of Huawei's earphones. It's enabled by default and gives music a softer, roomier profile, which is pleasant enough when you can actually hear what's playing. By the numbers, the Mate 20 Pro has practically the same Leica-endorsed triple-lens setup as the P20 Pro, which many regard as the best cameraphone in existence. There's one 40-megapixel sensor, one 20MP sensor and one 8MP camera with up to 3x optical zoom. Only, on the P20 Pro, the 20MP camera is monochrome. Its primary function is capturing light information and using that data to improve full-color images, though it will also take native (unfiltered) black-and-white images. On the Mate 20 Pro, this has been swapped out for a color, ultra-wide 20MP sensor that vastly increases field-of-view compared with the main, 40MP camera. Also, perhaps counterintuitively, it's great for extreme close-up, macro shots. Now, you don't actually want to take 40MP pictures. Tap that image size in the settings menu and you won't get access to the other lenses. Instead, you want to leave it on the 10MP setting. This doesn't retire the 40MP lens. Here, it will oversample the picture and make it the best it can be when it's squeezed down to the lower, 10MP resolution. It also lends a hand when zooming beyond 3x. The 8MP camera takes great detailed images at that range, but bump it up to 5x and hybrid zoom will mix in the feed from the 40MP sensor to help improve overall clarity. To put it bluntly, the Mate 20 Pro takes some incredible pictures, and, by design, it's a more versatile cameraphone than the P20 Pro. The newer flagship doesn't have the ability to take native black-and-white images, but the ultra-wide-angle shots it spits out are like instant high-quality panoramas. Macro performance has a similar wow factor. You can, essentially, get as close to an object as you want and maintain focus. It's almost like having a basic microscope in your pocket. Perhaps just as important as the Mate 20 Pro's three lenses is Huawei's Master AI, which is basically a hyper-intelligent auto mode. It seems to have been improved in Huawei's latest EMUI 9.0 software update, too, which hasn't hit the P20 Pro yet. During a photo session, I pointed the P20 Pro at a park scene, and it recognized it was green landscape, noting this conclusion in the viewfinder. On the Mate 20 Pro, it went one step further by identifying it was an autumnal landscape -- not that the actual output was notably different. I've had pretty much an identical experience with Master AI as Engadget's own Chris Velazco had when reviewing the P20 Pro. It does an excellent job making your photos look great; sometimes too great. The Mate 20 Pro almost stylizes pictures, like it's taken the original image and subtly tweaked it in Lightroom to make it prettier than real life. This isn't a bad thing -- it means you can consistently throw images on the 'gram with the #nofilter hashtag, for example -- but if your preference is realism then you'll either want to turn Master AI off and stick with the lackluster, regular auto mode, or switch it to full manual and play with settings yourself. Master AI is not infallible. Sometimes the white balance is a little bit off, the contrast a bit too heavy so portions of the image appear overly dark. It once took a bokeh-heavy portrait image simply because it detected a person in the frame. I sometimes tap around the viewfinder to change where the phone is taking lighting cues from, and then choose the result I like the best. I'm getting into minute detail here just to drive home the point that the three lenses and Master AI won't turn you into a National Geographic photographer overnight. The Mate 20 Pro offers an incredible hands-off camera experience, though -- Master AI does the hard work for you, so you don't need to know anything about cameras to take great snaps. When the sun goes down or you duck into a dingy music venue, Master AI seems to change its focus from stylizing images to simply taking great low-light pics with high levels of detail and minimal noise. The best photos are taken using the specific Night mode, but as this captures multiple exposures over the course of a few seconds before being blending into a single image, it's not ideal if there's any movement in the frame. Regular low-light photos are still comparable, they're just not quite as detailed. I have noticed a slight difference between the Mate 20 Pro and the P20 Pro in low light, and this is where I think that monochrome 20MP sensor comes into play. I've been toing and froing between comparison shots and I believe the Mate 20 Pro blows out light sources a fraction more than the P20 Pro does, making the latter phone marginally superior in this one regard. I think the added super-wide-angle and close-up options that the color 20MP sensor provides make up for this, however. The Mate 20 Pro has a couple of other, minor features that are missing from the P20 Pro. In Portrait mode, you can tell the AI to manipulate out-of-focus light sources to appear as custom shapes like hearts or diamonds, which is kinda neat. This will almost certainly be added to the P20 Pro when it gets the latest EMUI 9.0 update, though. The front-facing, 24-megapixel camera is identical across both devices and takes selfies that are almost too detailed. As you'd expect, there's a beautification slider that will edit out any shininess and pores you may not want to broadcast on social media. Making use of the added depth sensor on the front of the Mate 20 Pro, Huawei has also added what's basically a carbon copy of Apple's Animoji. There are a couple of other camera features that will make their way to the Mate 20 Pro over the next month or so: a 3D-scanning mode that will let you animate objects, and another that can apply video effects in real time using AI -- isolating one color in the viewfinder and stripping everything else down to black and white, for example. HiVision will have you pointing your camera at products, landmarks and food, so AI can provide contextual information, like where to buy those sneakers or the estimated nutritional value of your lunchtime salad. And there are plenty more standard features available on the device already, like a panorama mode (not that you need it) and slow-mo video. There's a special underwater mode, too, and Huawei's built a watertight case to protect the Mate 20 Pro from prolonged exposure if you care to make use of it. Competing handsets don't offer quite the same level of versatility as Huawei's latest device. I've spent most of my time with the Mate 20 Pro carrying around a Note 9, Pixel 3 XL and P20 Pro in my other three jean pockets. It's not necessarily a case of one being better than the other. In some scenarios, particularly using Portrait mode on all the devices, I actually preferred the color temperature of the Note 9 since its AI assistant tends to output more natural-looking images. The detail in some pictures taken on the Note 9, including in low-light, is marginally better than comparator shots from the Mate 20 Pro. It's a similar situation with the Pixel 3 XL. Google obviously has some amazing imaging software. I'm impressed with the low-light performance and the level of contrast in images in general. Google's latest phones only have single 12.2-megapixel cameras, but they churn out some great shots. It's the multiple lenses and apertures the Mate 20 Pro has at its disposal that separates it from the pack. The Note 9, Pixel 3 XL and P20 Pro simply can't replicate the Mate 20 Pro's super-wide-angle capability, for example, and where the Mate has 3x optical zoom, the Note 9 has 2x and the Pixel 3 XL, nothing. If Huawei upped the ante with the P20 Pro, then the Mate 20 Pro is ensuring the company maintains a reputation for building some the best cameraphones around. The Mate 20 Pro is the first phone running Huawei's EMUI 9.0 software, which is like an unnecessary topping on an already sweet Android 9 Pie. Huawei's skin is starting to look dated, especially when compared with the stylish, clean Material Design of stock Pie. You can personalize EMUI with various themes, icon packs and so on, but it still feels like it's stalled where stock Android design has kept moving forward. Just as Google has made mostly subtle improvements to Android in the latest version, such as the digital wellness feature that lets you monitor and cap your own usage, Huawei's kept its skin update lean. Aside from making the settings menu a bit neater, the company says most of what's new is invisible, speeding up performance and responsiveness compared with the last EMUI build. Huawei has similar things to say about its new octa-core Kirin 980 processor, which is one of the first 7nm mobile chips. In layman's terms, this means it's smaller and more tightly packed than your average CPU. Just the physical size of the thing improves performance and reduces power consumption compared with standard 10nm chips, like last year's Kirin 970. The eight cores also work together in clever ways to make everything as efficient as possible. Those with the lowest clock speeds take care of simple tasks like background processes, the fastest ones make sure games play at their best and middle-of-the-road cores handle everything else. Apart from any AI processes, that is, which is what the two neural processing units (NPUs) are for. These NPUs are designed specifically to deal with things like object recognition, so the other cores don't have to. Theoretically, having two of them means the camera can identify scenes or a translator app can distinguish text that much quicker. But Master AI, at least, isn't noticeably quicker on the Mate than the P20 Pro, which has just one NPU. It's all about balancing speed and efficiency, but the Mate 20 Pro has an above-average battery capacity to begin with. Everything comes together with satisfying results. I'm a relatively heavy user as it is, no more so than when I keep coming back to a review unit to check settings, test features, take pictures and the rest. Even under these conditions, I haven't been rushing to a power outlet towards the end of the day. By paying it a normal level of attention, you can squeeze two relatively full days out the battery. Not quite the good times of Nokia candy bars, but it's progress. When it comes to refueling, you have a couple of options. The Mate 20 Pro supports 40W fast-charging, which is very fast. It is on paper, anyway, but I can't verify claims that a 70 percent charge is possible in 30 minutes because my review unit included a European two-pin plug, not the UK one I need. I saw results closer to 70 percent recovery in double the time with the plugs and cables I have to hand. The Mate 20 Pro also supports 15W wireless charging, which again is faster than the industry average (the new Pixels max out at 10W with approved pads, for example). Wireless charging is notoriously slow, so any improvement here is welcome, not that I have hard stats to share since I don't have a wireless charger that outputs at 15W. Perhaps the craziest thing about the Mate 20 Pro, period, is that it can wirelessly charge any other phone that supports the Qi standard. Enable this in settings, put the two phones back to back and marvel at this strange act of digital parasitism. Chances are you will rarely if ever find use for this, but it's a feature that doesn't exist on any other phone, and that's kinda cool. Back to that Kirin 980 chip. Efficient power management is not secondary to performance here. I honestly don't feel there's anything between the big-name flagships these days. The user experience is incredibly fast and fluid across the board, and that's true of the Mate 20 Pro as well. It's as rapid and responsive as you need it to be, and you'd expect that from a $1000+ phone. There's even a high-performance mode you can enable in settings that forgets all about battery life, but I don't know when you'd need it. Annoyingly, PUBG Mobile isn't fully compatible with the Mate 20 Pro at the moment, for reasons unknown. It's still playable, you're just not able to push the graphics settings to their highest. I've messed around with several other graphically challenging games, though, with zero issues to report. Taking performance, efficiency and other things like Cat 21 LTE (up to 1.4 Gbps), WiFi 802.11ac Wave 2 and fast 2,133MHz LPDDR4X RAM support into consideration, the Kirin 980 in the Mate 20 Pro is certainly a competent chip. Depending on your region, the Mate 20 Pro comes with 6GB or 8GB of RAM and 128GB or 256GB of storage. That's plenty of space for most people, and technically the storage is expandable. Only, like an ill-conceived joke, Huawei created a proprietary memory card for the Mate 20 Pro, and presumably for its subsequent phones. It's the same size as a nano-SIM, which is to say it's a bit smaller than the microSD cards most people are familiar with. It makes for a slightly neater dual-SIM/memory card tray, but undoubtedly its primary reason to exist is so Huawei can squeeze a bit more money out of consumers. Shame on you. These cards don't appear to be cheap at first glance, either. On Amazon UK, a 128GB "NM Card" sells for just under £55 (roughly $70), which is more than double the price of an equivalent microSD card. The listing in question doesn't look all that official, though, so it could be an import with a wildly inflated price. Only time will tell. You'll know many of the biggest names in smartphones have unleashed their latest flagships over the past few months. The field is rife with strong competition for the Mate 20 Pro at the moment, whether that be from Samsung's Galaxy Note 9, Apple's new iPhones, Google's new Pixels or LG's V40 ThinQ. LG's new device isn't priced in the UK yet, but almost every other flagship mentioned above is at least as expensive as the £899 (roughly $1,150) Mate 20 Pro. Google's Pixels start at £739 (a few bucks shy of $950), and I must admit the smaller Pixel 3 is cute and stylish. Still, we're working within a relatively narrow, high price range, and the Mate 20 Pro is a front-runner in this category. You can't ignore the newly announced OnePlus 6T, though. Yet again, OnePlus has pulled together a near-flagship package for an attractive price. The 6T features an in-screen fingerprint reader just like the Mate 20 Pro, but it doesn't have quite as many bells and whistles. That said, with prices starting at $549/£499, you can't argue with that kind of value for money. Huawei's Mate 20 Pro is the best smartphone on the market right now. The cameras alone are a good reason to pick one up, and then there's the screen, the performance, the battery life and that gorgeous Twilight finish. Reverse wireless charging is perhaps gimmicky and of little use, but it's something entirely new. Even if the Mate 20 Pro isn't widely available where you live, you'll ultimately still benefit from its existence. I've no doubt other manufacturers are looking at what Huawei calls premium and thinking that if they don't keep stepping things up, they're going to get left behind.